Identification: Page and Burr (1991); Etnier and Starnes (1993); a commonly used name is Notropis galacturus. Native Range: Disjunct range east and west of Former Mississippi Embayment. Cumberland and Tennessee River drainages, Virginia, North Carolina, Kentucky, Tennessee, Georgia, Alabama, and Mississippi; upper Savannah and Santee drainages (Atlantic Slope), North Carolina, South Carolina, and Georgia; and upper New River drainage, Virginia. St. Francis and White River drainages, Missouri and Arkansas (Page and Burr 1991). Table 1. States with nonindigenous occurrences, the earliest and latest observations in each state, and the tally and names of HUCs with observations†. Names and dates are hyperlinked to their relevant specimen records. 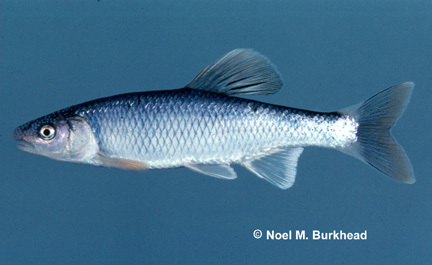 The list of references for all nonindigenous occurrences of Cyprinella galactura are found here. Means of Introduction: Populations of this species, interpreted as the result of human introductions, were most likely the result of bait bucket releases. Jenkins and Burkhead (1994) believed that the West Virginia population is the result of dispersal downstream from the introduced population in the New River in Virginia. Status: Established, possibly introduced, in parts of Kentucky, North Carolina, Virginia, and West Virginia. Remarks: Jenkins and Burkhead (1994) provided a series of arguments to support their position that this species was introduced into both the Big Sandy and New drainages. Both Lee et al. (1980 et seq.) and Jenkins and Burkhead (1994) concluded that its presence in the New River drainage was likely the result of human introduction because the species was not present in early collections. Previously, a few researchers had believed that the Big Sandy and New drainages were part of the species' natural distribution, possibly relict populations or the result of recent stream capture events (references in Jenkins and Burkhead 1994). Similarly, Tsai and Raney (1974) stated that C. galactura may have entered the Savannah River drainage of Atlantic Slope via stream capture. Voucher specimens: Virginia (USNM 104157). Rohde, F. C., R. G. Arndt, J. W. Foltz, and J. M. Quattro. 2009. Freshwater Fishes of South Carolina. University of South Carolina Press, Columbia, SC. 430 pp.